The Presidential Suite with panoramic views of the beautiful Monterey Bay is the largest suite at our hotel with over 1,000 square feet of living room and bedroom space. The luxury suite includes marble entry ways and boasts five balconies with spectacular views of the Monterey Bay from every angle. The Presidential Suite’s lavish accommodations include modern décor, calming colors and one-of-a-kind artwork. 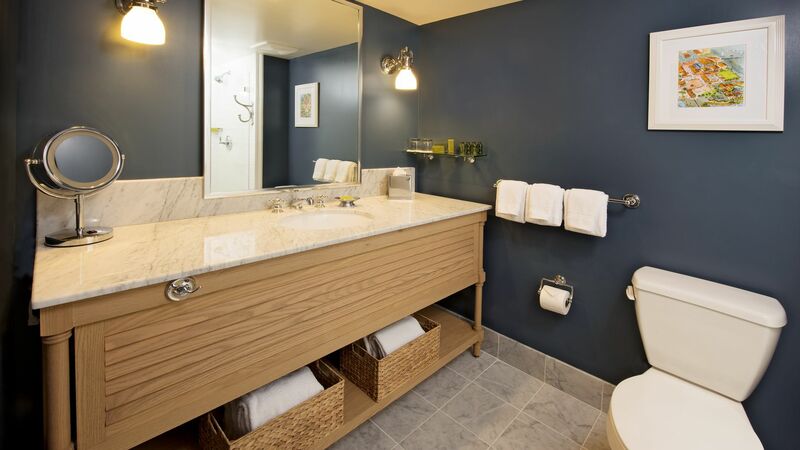 Relax and enjoy one of three flat screen televisions and an oversize soaking tub to wash away your stresses. The Presidential Suite includes a separate room with a king bed, two sofa sleepers and two bathrooms. The Presidential Suite at the Portola Hotel is an unforgettable experience for your next getaway and a leader among Monterey, CA suites. The Presidential Suite is unavailable for booking online. Please call (888) 222-5851 to book this room.